Innovation is everywhere. In the world of goods (technology), but also in the world of words: innovation is discussed in the scientific and technical literature, but also in the social sciences and humanities. 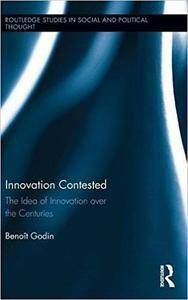 Innovation is also a central idea in the popular imaginary, in the media and in public policy. Innovation has become the emblem of the modern society and a panacea for resolving many problems. Today, innovation is spontaneously understood as technological innovation because of its contribution to economic "progress". Yet for 2,500 years, innovation had nothing to do with economics in a positive sense. Innovation was pejorative and political. It was a contested idea in philosophy, religion, politics and social affairs. Innovation only got de-contested in the last century. This occurred gradually beginning after the French revolution. Innovation shifted from a vice to a virtue. Innovation became an instrument for achieving political and social goals. In this book, Benoît Godin lucidly examines the representations and meaning(s) of innovation over time, its diverse uses, and the contexts in which the concept emerged and changed. This history is organized around three periods or episteme: the prohibition episteme, the instrument episteme, and the value episteme.